Home » Health » What Is Arteriosclerosis? 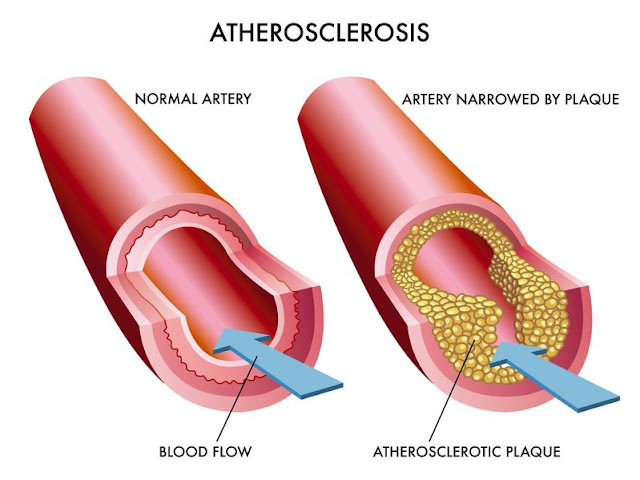 Arteriosclerosis is hardening of the arteries that carry blood from the heart to pass through the body. This condition is not normal because healthy blood vessels should be flexible and elastic. Arteriosclerosis causes the flow of blood that is rich in oxygen and nutrients from the heart to various body tissues become disrupted. Many people are often mistaken when interpreting arteriosclerosis with atherosclerosis and arteriosclerosis. Atherosclerosis and arteriosclerosis are derived from arteriosclerosis, so the symptoms and treatment of the three are not much different. All three are the same in the arteries. Early arteriosclerosis rarely causes symptoms. Signs of arteriosclerosis appear newly felt when the artery blood vessels narrow and blood flow clogged. This condition can lead to cardiovascular disease. Numbness in hands or feet, difficulty speaking, impaired vision, and facial muscles weakened or even paralyzed, if blockage occurs in arteries leading to the brain. Appears a chest pain called angina , if a blockage occurs in an artery that leads to the heart. Feet pain when walking, if the blockage occurs in arteries leading to the legs and feet. High blood pressure to kidney failure, if blockage occurs in the artery leading to the kidney. Arteriosclerosis is caused by hardening of artery walls. This can happen because of the accumulation of fat in the inner layer of the artery (atherosclerosis) or due to thickening of the arterial wall muscle due to high blood pressure (hypertension). When the inner lining of the artery is damaged, the blood cells and others will clot in the damaged area. Over time, plaque that is formed from cholesterol will also accumulate and harden in damaged areas. This causes the arteries to narrow, so the blood flow is inhibited. If the blood flow can not flow smoothly, the organs and tissues in the body also can not function properly. Frequent smoking and rarely exercise. Obesity and melalukan unhealthy diet. Blood pressure and high cholesterol. Stress and excessive alcohol consumption. Less intake of nutrients from fruits and vegetables. Blood tests, to detect elevated levels of cholesterol and blood sugar that can increase the risk of arteriosclerosis. Cardiac catheterization, to see if there is blockage or constriction in the heart arteries with the help of a catheter. Scanning, to detect calcium deposits and aneurysms in the arteries. This test can be done via CT scan or MRA. Electrocardiogram (EKG), to record electrical signals sent by the heart at a given time. Doppler ultrasound, to measure blood pressure and velocity passing through the arteries through the arm or leg. Stress test, to determine the response shown by the patient when the heart works hard. Usually patients will be asked to walk on a treadmill . Ankle-brachial index, to check for the possibility of arteriosclerosis in the legs and feet. Changing lifestyle. Eating healthy foods, exercising regularly, and abstaining from cigarettes can reduce the risk of heart attacks, strokes, and more severe disease due to arteriosclerosis. Take drugs. The formation of plaque and arterial wall hardening can be stopped by taking cholesterol-lowering drugs, high blood pressure, and antiplatelet drugs to break down blood clots. Surgical angioplasty . In the procedure preceded by this angiography, the doctor will open the blood vessels and insert a tool in the form of a balloon or a stent to break down the blockage inside. This procedure can reduce the symptoms of arteriosclerosis. Heart bypass surgery . The surgeon will take or transplant some healthy blood vessels (usually from the limbs or chest) and remove and stitch them in clogged parts. Arteriosclerosis can be prevented by minimizing the above-mentioned risk factors. Therefore, establish a healthy lifestyle, including eating nutritious foods and exercising regularly. 0 Response to "What Is Arteriosclerosis?"